Revolution’s second episode, “Chained Heat,” starts with a flashback, in what looks like the day after the blackout. Parents Ben and Rachel, with their children Charlie and Danny, begin their trek out of the dangerous city and into the safety of the wilderness. In the show’s present, Charlie, Maggie and Aaron join Miles as he searches for his old friend Nora. Charlie wants to get on with it and find her captive brother, but Miles insists on finding Nora first. Elsewhere, Captain Neville (with Danny still captive) finds a guy with a gun. Guns are outlawed in Monroe Militia controlled territories, and carrying one is punishable by death. So, Neville shoots the guy, but not before the guy takes down a member of the Militia. Danny witnesses all this and silently judges everyone for their actions. This is also when the show introduces a solid rebel movement that’s still loyal to the now defunct United States. It also turns out that Nora is working with the rebellion, so that’ll probably play into the overarching plot in upcoming episodes. Miles and Charlie find Nora (played by the beautiful Daniella Alonso), but she’s part of a chain gang of Munroe’s Militia prisoners. They succeed in rescuing her only to learn that she didn’t need rescuing. It was a con job – she let herself become a prisoner so she could get close to the warden’s high-powered sniper rifle. So Miles and Charlie agree to help Nora get the rifle, which requires Charlie to murder the warden. Miles doesn’t think Charlie is capable of murder, but we soon find out that, yes, she can murder someone. With a hand-made wrist-mounted gun, at that. Maggie and Aaron wake to find Charlie gone, and discover that she went after Miles. Aaron talks Maggie out of searching for Charlie by showing her the magical electro-necklace-charm thing that Ben gave him. Aaron lets Maggie in on his secret mission to bring the charm to a woman named Grace. Grace happens to be the woman who helped Danny out when he tried to escape Munroe’s Militia last episode, and happens to have an electro-necklace-charm thingy as well. Someone named Randall finds her and breaks her door in. He has an electro-necklace-charm thing too, and is the only person so far to actually wear it as a necklace. Randall apparently uses his charm to power a cattle prod that he uses as a weapon. The episode ends with General Munroe meeting with a character that was said to be dead last episode – Rachel, Charlie and Danny’s mother. Munroe delivers the news that her husband is dead and that he has her son hostage. Rachel tries to kill Munroe, but fails. Munroe uses Danny as a way of getting Rachel to talk about Ben and the blackout. Will she? To be continued! 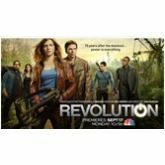 Revolution airs Mondays at 10/9 c on NBC.